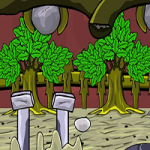 Games2Jolly - G2J Ancient Lilliput Rescue Escape is another point and click escape game developed by Games 2 Jolly. We know that you are a great fan of escape games but that doesn’t mean you should not like puzzles. So, here we present you this puzzle escape game, a cocktail with an essence of both puzzles and escape tricks. Good luck and have fun! Use nail as lever in first scene. Those little *snowmen* look so miserable! Thx for your game G2J. I can swear that I never ever in my life found a hammer burried in a log or a curling stone hidden in a vault. However, nice game.